So how can we feel better? Incorporating small, realistic changes to your everyday routine can make all the difference. We've compiled our top tips, from taking a brisk walk at lunch to preparing healthy snacks. Kick-start a busy day with a satisfying breakfast that will power you through until lunch. As well as keeping you energized, it can also help you to resist a sugar craving or caffeine fix. Whip up a protein-rich herby omelet, try a wholesome bowl of porridge or, if you want a grab-and-go breakfast, make a jar of overnight oats the evening before. If you don't normally eat much early in the morning, try a smoothie or fruity yogurt pot. Sugary snacks might give you an instant energy rush, but this can often be followed by a slump (and cravings for yet another biscuit). While we're all in favor of the occasional treat, there are plenty of healthier options that are just as tasty – and that won't mess with your blood sugar levels quite so much. Our 10 low-sugar snacks are great for combating that 3 pm slump. From crispy courgette fritters to curried popcorn, these brilliant bites deliver on taste and contain no more than 5g sugar per 100g. If you have a sweet tooth, the whole fruit offers a healthy way to curb a craving. Different fruits have individual health benefits, but all count towards your five-a-day and provide valuable vitamins, minerals, and fiber. Try bringing in bananas, oranges, apples or pre-prepared portions of pineapple or mango to snack on. When it comes to lunchtime, planning is key. Aim for a balance of lean protein, slow-release carbs, healthy fats and plenty of colorful vegetables. Canteen meals and shop-bought sandwiches are often high in salt, sugar and saturated fat, so put aside some time the night before to make yourself a delicious and healthy packed lunch that you know you'll look forward to. We've got plenty of ideas for quick, easy and nutritious meals you can prep ahead for work, including whole grain pasta boxes, brown rice salads, nutritious sandwiches and wraps, satisfying soups and protein pots. If you're looking to reduce your caffeine intake, it's worth winding down slowly. Rapid withdrawal could leave you with headaches, so it may be best to cut back gradually over two to three weeks rather than quitting cold turkey. It's often easy to lose track of how much water you're drinking. 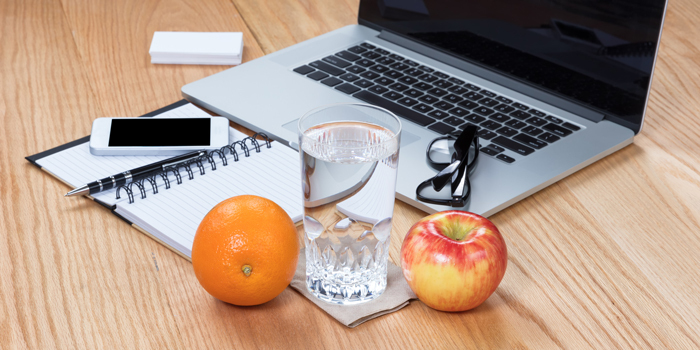 However, even mild levels of dehydration (losing 1% of your body weight in fluid) can lead to fatigue and headaches – not what you need on a busy workday! Signs of dehydration may include thirst, passing dark-colored urine, feeling lethargic or dizzy or having a dry mouth and lips. Although individual needs vary, the NHS recommends that, on average, we should consume around 6-8 glasses a day. If you're not keen on the taste of plain water, try diluting some fruit juice or check out our ideas for infusing your water with fruit and herbs for an added flavor boost. Buying a reusable water bottle that you enjoy drinking from may also encourage you to drink more, as well as helping to protect the environment. So how can we feel better? Incorporating small, realistic changes to your everyday routine can make all the difference. We've compiled our top tips, from taking a brisk walk at lunch to preparing healthy snacks.